According to data of MTSAT 0906141930 UTC the great volcanic explosion occurred. The suggested height of ash plume is up to 8 km. According to MODIS 0906150007 UTC all ash cloud are seen on the south-east and north-west. whole length is more than 600 km. A volcanic ash advisory from Tokyo VAAC timed at 06:15 GMT today reports observations of an ash cloud at FL450 (45000 feet a.s.l., which is about 13700 metres). An earlier report (00:05 GMT today) reported ash at FL540 (54000 feet a.s.l., about 16450 metres). A SVERT report from 14 June referred to an ash plume ‘about 12 km above sea level’ following a ‘large explosion’ at the volcano. Ash emissions at this height over the North Pacific have potential to disrupt air traffic. Information can be hard to come by, however, as SVERT is not a 24-hour operation and volcanoes in this area, including Sarychev Peak, are not directly monitored through instruments. 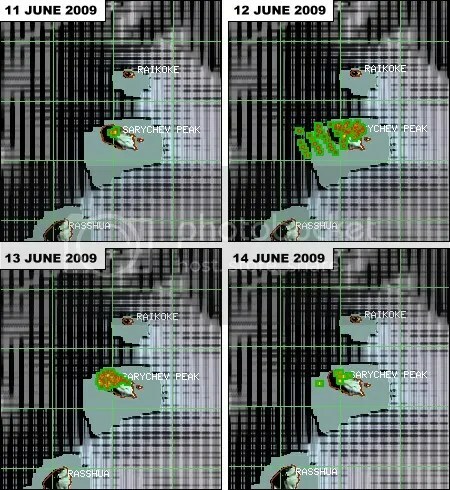 Above: Montage of MODIS images of thermal anomalies at Sarychev Peak, 11-14 June 2009 (Hawaii Institute of Geophysics and Planetology). More updates on Sarychev Peak as information comes in, and there’s more coverage at Eruptions as well. The Volcanism Blog’s Russian-language department is currently on holiday: we’ll check out any Russian media reports on this eruption as soon as she gets back. Posted by admin in activity reports, eruptions, NASA Earth Observatory, Russia, Sarychev Peak. A quick update on reports of activity at Sarychev Peak, which is a remote volcano in the (Russian) central Kuril Islands. It is a highly active volcano: the most recent eruption, which appears to have been relatively minor, was in January 1989, while the most recent significant eruption appears to be that of September-October 1976. There was a very large VEI=4 explosive eruption in November 1946. Well, it appears that the volcano is erupting again, and the NASA Earth Observatory has two dramatic satellite pictures acquired on 12 and 13 June 2009 showing a high-altitude plume with considerable ash content. I hope we’ll have more information about this obscure volcano and its current activity later. Posted by admin in Kamchatka, NASA Earth Observatory, Russia, Shiveluch. The NASA Earth Observatory has published a lovely image today of the Kamchatkan volcano Shiveluch erupting, captured on 10 May 2009 the Advanced Spaceborne Thermal Emission and Reflection Radiometer (ASTER) on NASA’s Terra satellite. The white colour of the northward-directed plume shows that it is predominantly steam, while brown ash deposits from previous eruptions blanket the snow around the volcano’s summit. Shiveluch is one of the most frequently active Kamchatka volcanoes. NASA Earth Observatory: Plume from Shiveluch volcano (14 May 2009). Lots of volcano-related Earth Observatory images here: NASA Earth Observatory « The Volcanism Blog. Posted by admin in activity reports, eruptions, Kamchatka, NASA Earth Observatory, Russia, Shiveluch. 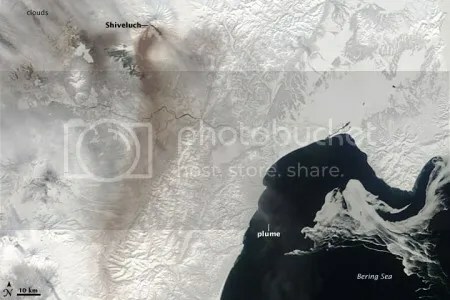 Shiveluch volcano in Kamchatka is continuing to erupt, producing a 7-kilometre ash plume according to this interestingly-phrased report from Russia Info-Centre. The latest bulletin from KVERT (issued 04:25 UTC today) reports ash plumes extending 250 kilometres NE of the volcano and reaching 5 kilometres altitude, and seismicity consisting of weak volcanic tremor and occasional shallow earthquakes. Ash explosions to above 10 kilometres, warns KVERT, could occur at any time. The image above is from the NASA Earth Observatory, and shows the plume from Shiveluch on 26 April 2009, blowing SE towards the Bering Sea. This is a MODIS image from NASA’s Terra satellite. A Russian-language report today from RIA-Novosti, which does not appear to be available in English, says that a new 30-metre-deep fissure has formed on the Molody Shiveluch (‘Young Shiveluch’) lava dome which is the focus of the current activity. The report quotes Alexei Ozerov of the Institute of Volcanology: ‘This fissure was formed over the last two days, and crosses the body of the volcanic dome in a south-easterly direction. It is continuously producing hot debris avalanches’. One pyroclastic flow may have destroyed a road and bridge on the Bekesh river, although the precise location is unclear. The report also notes that Koryaksky and Kliuchevskoi volcanoes in Kamchatka are also currently active, and that there is increased seismic activity at Gorely, which last erupted in 1986. This level of activity, however, is nothing unusual for Kamchatka. This Shiveluch webcam enables you to peer through the trees at the volcano. Thanks to AS for her translations from the Russian. Posted by admin in activity reports, eruptions, Kamchatka, Russia, Shiveluch. The Kamchatkan Volcanic Eruption Response Team (KVERT) have issued an information release (27 April, 01:05 UTC) for Shiveluch volcano in northern Kamchatka, reporting that seismic activity at the volcano has slightly decreased, with continuous tremor becoming intermittent and the number of weak shallow earthquakes declining, but the ‘danger of a strong explosive eruption’ remains, with explosive eruption of ash to 10 kilometers a.s.l. possible at any time. The current level of concern colour code for Shiveluch is given as Red. Tokyo VAAC has a volcanic ash advisory notice for Shiveluch issued at 06:08 UTC reporting a possible eruption observed at 01:59 UTC, with ash at FL140 (14000 feet, 4300 metres). Posted by admin in activity reports, Kamchatka, Koryaksky, Russia, volcano monitoring. Images from a video camera monitoring Koryaksky volcano on the Kamchatka Peninsula in eastern Russia are available via the Kamchatkan Volcanic Eruption Response Team (KVERT) website. Click on the link below to access the Koryaksky webcam page. The latest updates for Koryaksky report that strong fumarolic activity continues, and ash explosions up to 6km above sea level are possible. Seismicity at the volcano remains at background levels. Recent images of Koryaksky can be found on this page of the KVERT website. 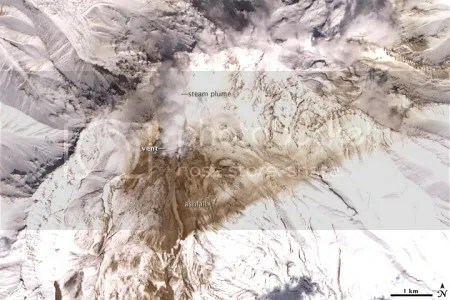 The same report indicates that the reason for the heightened alert is a new vent about 3.1-3.3 kilometres above sea level (Koryaksky’s summit elevation is 3.456 km), at a point where fumarolic activity has been observed over a long period. The current alert level is given by KVERT as orange, which is the second-highest level, and the most recent KVERT bulletin on Koryaksky reports a moderate explosive eruption, ash plumes rising to 4.0km, no seismic data ‘for technical reasons’, and expects the activity of the volcano to increase. Russian news reports speak of a volcanic ash hazard for aircraft: a local news report today says that dark ash emissions are rising to 4.0km above sea level. The Tokyo Volcanic Ash Advisory Center has no current ash alerts for Koryaksky, but ash at low altitudes could well be dangerous for the operation of airports in the vicinity of the volcano, hence the closure. With neigbouring Avachinsky, Koryaksky has been designated a Decade Volcano because of its history of explosive eruptions and its proximity to populated areas. A report from RIA-Novosti in Russia says that 170 tremors have been recorded over the last 24 hours at the Kamchatkan volcano Shiveluch, and that the volcano is erupting ash to an altitude of 4000m. According to this report the ash emission is ‘causing problems for air traffic’. The latest reports from Tokyo VAAC, however, indicate that although the eruption has been observed no significant ash cloud has been reported or is expected, and no warnings have been issued. Shiveluch is a highly active volcano, ‘the most vigorous andesitic volcano of the Kuril-Kamchatka arc’, says the summary page at the Global Volcanism Program. Posted by admin in activity reports, eruptions, Kamchatka, Kliuchevskoi, Russia. 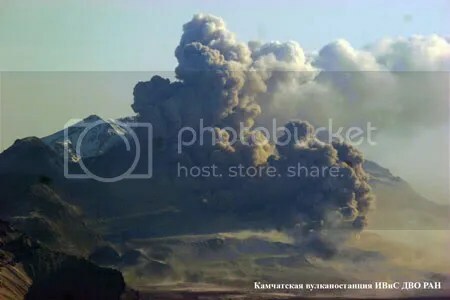 Russian news agency RIA Novosti reported yesterday that Kliuchevskoi, the tallest (4385m) and arguably the most beautiful of the Kamchatka volcanoes, has erupted. The most recent bulletin from the Kamchatkan Volcano Event Response Team (KVERT) characterizes the current eruption as ‘weak strombolian activity’, and warns that the activity may intensify – a point also made by Alexei Ozerov, the Russian scientist quoted in the Novosti report. Ozerov warns that increased luminescence at the summit indicates the emergence of fresh lava, and that lava flows could trigger lahars and pose a threat to surrounding villages. The possibility of erupted ash interfering with air traffic is also mentioned, although as there are no current volcanic ash advisories for Kliuchevskoi at either Tokyo or Anchorage VAACs it seems that there is no significant eruption cloud as yet. Over the last month or so, fumarolic activity and elevated seismicity have indicated that a significant eruption was to be expected. Kliuchevskoi is one of the youngest and most active Kamchatkan volcanoes: the Smithsonian Institution Global Volcanism Program lists nine significant eruptions over the last decade.